in Westville, South Africa, on October 10, 1975. The soul transmigrates at every moment as our body changes from childhood, to youth, and then to old age. When the body disintegrates at death, the soul start s another round of transmigration in a new body. For those who wish to break free o f this painful cycle of repeated death and rebirth, the Vedic literature provides the method: Krsna consciousness. Dr. Oliver: We are in this twentieth century, this last part of the century, with a new global search for the truth about the spiritual. We, of course, in the Western world, are not familiar with the Bhagavad-gita. Our problem is basically, I think, the one that you raised in your lecture: How do we make the spiritual a scientific reality? And I think you were quite right. I think really few people get the point that you were trying to make—that this is a scientific matter. Srila Prabhupada: That is the beginning of the Bhagavad-gita—scientifically presenting spiritual knowledge. Therefore I raised the question: What is transmigration of the soul? Nobody could reply properly. We are changing bodies. 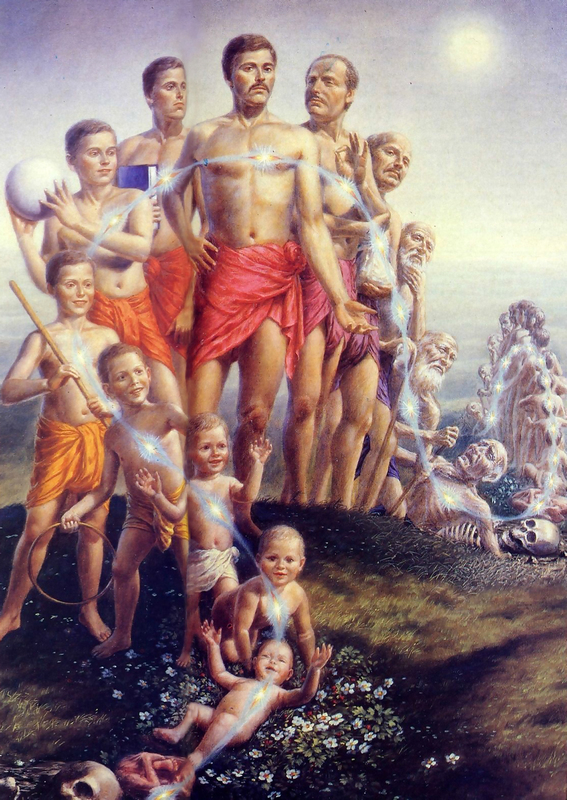 There are so many varieties of bodies, and we may enter into any one of them after death. This is the real problem of life. Prakrteh kriyamanani gunaih karmani sarvasah: nature is working, providing us with material bodies. This body is a machine. This machine, just like a car, has been offered to us by material nature, by the order of God, Krsna. So the real purpose of life is to stop this perpetual transmigration from one body to another, one body to another, and revive our original, spiritual position so that we can live an eternal, blissful life of knowledge. That is the aim of life. Dr. Oliver: The conception of transmigration is not, of course, in the Christian religion. Srila Prabhupada: It’s not a question of religion. Religion is a kind of faith that develops according to time and circumstances. The reality is that we are spirit souls. By the laws of material nature, we are carried from one body to another. Sometimes we are happy, sometimes distressed; sometimes in the heavenly planets, sometimes in lower planets. And human life is meant for stopping this process of transmigration and reviving our original consciousness. We have to go back home, back to Godhead, and live eternally. This is the whole scheme of Vedic literature. The Bhagavad-gita gives the synopsis of how to act in this life. Therefore, through the teachings of the Bhagavad-gita we can begin to understand the constitutional position of the soul. First of all we have to understand what we are. Am I this body or something else? This is the first question. I was trying to answer this, but some people in my audience thought it was a kind of Hindu culture. It is not Hindu culture. It is a scientific conception. You are a child for some time. Then you become a boy. Then you become a young man, and then you become an old man. In this way you are always changing bodies. This is a fact. It is not a Hindu conception of religion. It applies to everyone. [To a devotee:] Find this verse. Srila Prabhupada: In the Bhagavad-gita everything is explained very logically, very scientifically. It is not a sentimental explanation. Dr. Oliver: The problem, as I see it, is how to get modern man to make an in-depth study of what is contained or outlined in this book, especially when he’s caught up in an educational system that denies a place for this very concept or even the philosophy of it. There is either complete neutrality, or just a simple rejection of these truths. Srila Prabhupada: They do not accept the soul? Dr. Oliver: They accept the soul. I think so. But they do not care to analyze what it means. Srila Prabhupada: Without analyzing this, what is their situation? First of all, they should analyze the distinction between a dead body and a living body. The body is always dead, just like a motorcar without a driver. The car is always a lump of matter. Similarly, this body, with or without the soul, is a lump of matter. Dr. Oliver: It isn’t worth very much. I think around fifty-six cents. Srila Prabhupada: But if one cannot distinguish between the car and the driver of the car, then he is just like a child. A child thinks the car is running automatically. But that is his foolishness. There is a driver. The child may not know, but when he is grown up and has been educated and still he does not know, then what is the meaning of his education? Dr. Oliver: In the Western world the whole range of education covers only primary, secondary, and tertiary education. There is no place for an in-depth study of the soul. Srila Prabhupada: I talked with one professor in Moscow. Maybe you know him—Professor Kotovsky. He teaches at the Soviet Academy of Sciences. I had a talk with him for about an hour. He said, “After this body is annihilated, everything is finished.” I was surprised that he told me this. He is known to be a very good scholar, and still he does not know about the soul. Dr. Oliver: We have an Indology course here, given by a scholar from Vienna. But what he teaches, what kind of basic philosophy, I wouldn’t know. There are about forty students. In essence they ought to start by making a detailed study of the Bhagavad-gita and use that as a basis for their whole philosophy. Srila Prabhupada: So why not appoint someone to teach Bhagavad-gita As It Is? That is essential. Dr. Oliver: Our university almost has an obligation to make a study of these points in depth. 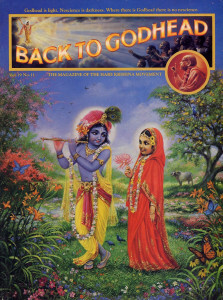 Srila Prabhupada: By thoroughly studying Bhagavad-gita, one begins his spiritual education. Dr. Oliver: Well, this is apparently what one needs. Our Hindu community here in South Africa seems to lack any fixed idea of what constitutes Hinduism. The young people especially are living in a complete vacuum. For various reasons, they do not want to accept religion, because this is what they see around them. They cannot identify with the Christian religion, the Islamic religion, or the Hindu religion. They are largely ignorant. Srila Prabhupada: They should be shown the right path. This is the original, authentic path. Dr. Oliver: There were not very many great scholars in South Africa amongst our Indian community. The Indian people came, by and large, as workers on the sugar plantations—field workers. A few were jewelers and tailors and so on. Then for the last hundred years there was a political struggle, resisting transportation back to India. They were fighting to make a living and to find their own place in this country. As I see it, they must give meaning to the essence of their own beliefs and faith. I’ve been telling them that we are privileged to have them here in this country with their background, and that they mustn’t cut themselves away from it and drift into a vacuum. But they don’t know to whom they should turn. So basically, they and myself and others want to know how we get this spirit into our own hearts, and how does this then issue out into everyday living? Srila Prabhupada: That is all explained in the Bhagavad-gita: how to live peacefully in this world and how to go back home, back to Godhead. Dr. Oliver: But how does one get modern man to voluntarily make this experiment? The real tragedy is we have wandered so far away from the spirit that we do not know where to start. And we can’t get a few dozen honest believers to sit down and try to find out how much God wants to give of His mind to our minds. Srila Prabhupada: God is giving Himself. We just have to accept Him. That requires a little advancement. Otherwise, everything is there. God says that the soul is eternal and the body is changing. It is a very simple example. A boy becomes a young man, and a young man becomes an old man. There is no denying this fact. I can understand it, and you can understand it. It is very simple. I remember that as a boy I was jumping, and I cannot do that now because I have a different body. So I am conscious that I possessed a body like that. Now I do not possess it. The body is changing, but I am the same person eternally. It requires a little intelligence to see this, that’s all. I am the owner of the body, and I am an eternal soul. The body is changing. Dr. Oliver: Now, having accepted that, a further problem then arises: What are the implications? Srila Prabhupada: Yes. If I understand that I am not this body, yet at the present moment I am engaged only to keep my body comfortable, without taking care of my self, that is wrong. For example, if I am cleansing this shirt and coat thrice daily, but I am hungry—that would be impractical. Similarly, this civilization is wrong in this basic way. If I take care of your shirt and coat, but I don’t give you anything to eat, then how long will you be satisfied? That is my point. That is the basic mistake. Material civilization means taking care of the body and bodily comforts. But the owner of the body, the spirit soul, gets no care. Therefore everyone is restless. They are changing the “ism” from capitalism to communism, but they do not know what the mistake is. Dr. Oliver: There is very little difference. They are both material. Srila Prabhupada: The communists think that if we take control of the government, everything will be adjusted. But the mistake is there—both the communists and the capitalists are taking care of the external body, not the eternal identity, the soul. The soul must be peaceful. Then everything will be peaceful. [To a devotee:} Read that verse. Srila Prabhupada: This means that one must know what God is. Because you are part and parcel of God, you already have a very intimate relationship with Him. Our business is knowing God. So at the present moment, there is no information. People have no complete idea. Dr. Oliver: Well, I believe that if a satellite in the sky can reveal what is happening from one pole to the other pole, then surely God can reveal His spirit and His mind to anyone who wants to obey Him, who wants to know Him, and who sincerely wants to follow Him. Srila Prabhupada: Yes, yes. So here in the Bhagavad-gita God is explaining Himself. We have to take it by logic and reason. Then it will be a clear understanding of God. Dr. Oliver: Yes, but how to get this across? Srila Prabhupada: The teaching is there. We have to understand it by authoritative discussion. Dr. Oliver: I think so. This is probable where one has to start. We have to sit down and discuss this, much the same as some professors would discuss any scientific experiment. [To a devotee:} Find out that verse. Devotee: “The path of spiritual realization is undoubtedly difficult. The Lord therefore advises us to approach a bona fide spiritual master in the line of disciplic succession from the Lord Himself. No one can be a bona fide spiritual master without following this principle of disciplic succession. The Lord is the original spiritual master, and a person in the disciplic succession can convey the Lord’s message as it is, to the disciple. “No one can be spiritually realized by manufacturing his own process, as is the fashion of the foolish pretenders. The Srimad-Bhagavatam (6.3.19) says, dharmam tu saksad bhagavat-pranitam: the path of religion is directly enunciated by the Lord. Therefore, mental speculation or dry arguments cannot help lead one to the right path. Nor by independent study of books of knowledge can one progress in spiritual life. “One has to approach a bona fide spiritual master to receive the knowledge. Such a spiritual master should be accepted in full surrender, and one should serve the spiritual master like a menial servant, without false prestige. Satisfaction of the self-realized spiritual master is the secret of advancement in spintu;i] life. Inquiries and submission constitute the proper combination for spiritual understanding. Unless there is submission and service, inquiries from the learned spiritual master will not he effective. One must he able to pass the test of the spiritual master, and when he sees the genuine desire of the disciple, he automatically blesses the disciple with genuine spiritual understanding. Srila Prabhupada: The practical example is here. These European and American boys are coming from well-to-do families. Why are they serving me? I am Indian, coming from a poor country. I cannot pay them. When I came to the West. I had no money. I brought only forty rupees. That was only an hour’s expenditure in America. So their soul is to carry out my instruction. And therefore they are making progress. Pranipatena pariprasnena—they are asking questions. I am trying to reply to them, and they have all got full faith. They are serving like menial servants. This is the process. If the spiritual master is bona fide and the disciple is very sincere, then the knowledge will be there. This is the secret. Yasya deve para bhaktir yatha deve tatha gurau—Vedic knowledge is revealed unto those who have faith in both the Lord and the spiritual master. Therefore in Vedic society, the students are automatically sent to the gurukula [the place of the spiritual master], regardless of whether one is a king’s son or from some other background. Even Krsna had to go to gurukula. There is a story that once Krsna went with a classmate to the forest to collect dry wood for His spiritual master. Suddenly there was a heavy rain storm, and they could not get out of the forest. The whole night they remained in the forest with great difficulty. There were torrents of rain. The next morning, the guru, their teacher, along with other students, came to the forest and found them. So even Krsna, whom we accept as the Supreme Lord. had to go to gurukula and serve the spiritual master as a menial servant. So all of the students at the gurukula learn how to be very submissive and how to live only for the benefit of the guru. They are trained from the very beginning to be first-class submissive students. Then the guru, out of affection and with an open heart, teaches the hoys all he knows. This is the process. There is no question of money. It is all done on the basis of love and education. Dr. Oliver: I might have difficulty accepting parts of what you’ve indicated here, simply because I don’t know. But basically I accept that God lives in us and that when we leave things to Him, He knows how to direct these things. The challenge is living life so that He will be satisfied. This is where the difficulty comes in: you need the inspiration to be disciplined. This will only become a reality in one’s life if one practices it. And practices it with others who share this commitment. Srila Prabhupada: Therefore we have this International Society for Krishna Consciousness—showing how to live a life of dedication to God. That is required. Without practical life in God consciousness, it remains simply theoretical. That may help, but it takes longer. My students are being trained up in practical spiritual life, and they are established. Dr. Oliver: I want to thank you very much, and I pray that God will bless your visit to our country and our people here.